In this video, Dr. Huntoon discusses Blood Pressure and what you need to know about yours. When you go to your doctor and have your blood pressure taken, you need to have them do it this specific way and share the numbers with you. If they take it any other way, they are misleading you with any results that may be considered high, without taking it this specific way. About 1 in 3 U.S. adults—an estimated 68 million—have high blood pressure. Blood pressure is the force of blood against your artery walls as it circulates through your body. Blood pressure normally rises and falls throughout the day, but it can cause health problems if it stays too high for a long time. High blood pressure increases the risk for heart disease and stroke, some of the leading causes of death in the United States. High blood pressure is called the "silent killer" because it often has no warning signs or symptoms, and many people don't realize they have it. That is why it's important to get your blood pressure checked regularly. The good news is that you can take steps to prevent high blood pressure, or to treat it if it is already high. Measuring your blood pressure is quick and painless. A doctor or health professional wraps an inflatable cuff with a pressure gauge around your arm to squeeze the blood vessels. Then he or she listens to your pulse with a stethoscope while releasing air from the cuff and watching the gauge. The gauge measures blood pressure in millimeters of mercury, which is abbreviated as mmHg. This should always be done in 3 positions every doctor visit (seated, standing and laying down). The first (systolic) number represents the pressure in your blood vessels when your heart beats. The second (diastolic) number represents the pressure in your vessels when your heart rests between beats. The difference between the two numbers tells us the Pulse Pressure, or the amount of stress on the heart with each cycle of pumping. This is the most important number you could know, as it tells you the amount of stress that is on your heart simply by doing its normal function of pumping blood. You always want to know what your Pulse Pressure is when having your blood pressure taken. Some health conditions, as well as lifestyle and genetic factors, can put people at a higher risk for developing high blood pressure. However, everyone can take steps to lower their blood pressure. Healthy behaviors contribute to keeping your blood pressure low, which in turn decreases your risk of heart disease. Conversely, unhealthy activities can put you at a higher risk. Diet - Sodium is the element in salt that can raise blood pressure. Most of the sodium we eat comes from processed and restaurant foods. Eating too much sodium can increase blood pressure. Not eating enough potassium (from fruits and vegetables) can also increase blood pressure. Weight - Being overweight can cause high blood pressure. Physical Inactivity - Not getting enough exercise can make you gain weight, which can lead to high blood pressure. Alcohol Use - Drinking too much alcohol can raise your blood pressure. Tobacco Use - Smoking raises your risk for high blood pressure. High blood pressure can run in families. People can inherit genes that make them more likely to develop the condition. The risk for high blood pressure can increase even more when heredity is combined with unhealthy lifestyle choices, such as smoking cigarettes and eating a poor diet. Find out more about genetics and diseases on CDC's Public Health Genomics Web site. Because blood pressure tends to rise as people get older, everyone's risk for high blood pressure increases with age. In addition, some medical conditions can also raise your risk of high blood pressure. (Blood pressure levels that are slightly higher than normal) increases the risk that you will go on to develop chronic high blood pressure. Should You Medicate Pre-Hypertension? If you already have high blood pressure, your medical doctor may prescribe medications in addition to lifestyle changes. Eat a healthy diet. Eating healthfully can help keep your blood pressure down. Eat lots of fresh fruits and vegetables, which provide nutrients such as potassium and fiber. Also, eat foods that are low in saturated fat and cholesterol. Avoid sodium by limiting the amount of salt you add to your food. 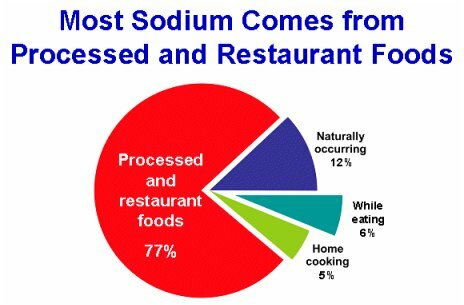 Be aware that many processed foods and restaurant meals are high in sodium. Studies have shown that people who eat a healthy diet can lower their blood pressure. For more information on healthy diet and nutrition, see CDC's Nutrition and Physical Activity Program Web site. Maintain a healthy weight. Being overweight can raise your blood pressure. Losing weight can help you lower your blood pressure. To find out whether your weight is healthy, doctors often calculate a number called the body mass index (BMI). Doctors sometimes also use waist and hip measurements to measure a person’s excess body fat. Most of the sodium we consume is in the form of salt, and the vast majority of sodium we consume is in processed and restaurant foods. Too much sodium is bad for your health. It can increase your blood pressure and your risk for a heart attack and stroke. Heart disease and stroke are the first and third killers of men and women in the United States each year. Most of the sodium we eat comes from packaged, processed, store-bought, and restaurants foods. Only a small amount comes from salt added during cooking and from being added at the table, and most Americans have already exceeded their daily limit of sodium before cooking or adding salt at the table. You can find out how much sodium you are eating by checking the labels on food products and adding up the milligrams of sodium. If at a restaurant, ask for nutritional information facts that include sodium. Source: Mattes, RD, Donnelly, D. Relative contributions of dietary sodium sources. Journal of the American College of Nutrition 1991;10(4):383–393. The DASH eating plan (Dietary Approaches to Stop Hypertension) is a simple heart healthy diet that can help prevent or lower high blood pressure. This diet is LOW in sodium, cholesterol, saturated and total fat, and HIGH in fruits and vegetables, fiber, potassium, and low-fat dairy products. Making other lifestyle changes, like getting more physical activity, while on the DASH eating plan gives you the biggest benefits. Learn more about the DASH Eating Plan. Working with a Holistic Chiropractor who can help you monitor your blood pressure and address the underlying cause of your high blood pressure is important. By developing a well-rounded multifaceted approach will help you understand how to maintain a normal blood pressure level and what you can do to increase your cardiovascular and blood pressure health. High blood pressure increases your risk for heart disease. People at any age can take steps each day to keep blood pressure levels normal. Working with a Holistic Chiropractor is the best way to develop a life-style for creating normal blood pressure. Be physically active. Physical activity can help lower blood pressure. The Surgeon General recommends that adults should engage in moderate physical activities for at least 30 minutes on most days of the week. Your doctor can measure your blood pressure, or you can use a machine available at many pharmacies. You can also use a home monitoring device to measure your blood pressure. Make sure you always check your blood pressure in 3 positions to fully understand what your blood pressure is and how your body is reacting to stress. This will help you and your doctor understand the underlying cause of your blood pressure and help you develop a plan for restoring balance to your blood pressure. Don't smoke. Smoking injures blood vessels and speeds up the hardening of the arteries. Further, smoking is a major risk for heart disease and stroke. If you don’t smoke, don’t start. If you do smoke, quitting will lower your risk for heart disease and stroke. Your doctor can suggest programs to help you quit. Limit alcohol use. Drinking too much alcohol is associated with high blood pressure.If you drink alcohol, you should do so in moderation—no more than one drink per day for women or two drinks per day for men. Many Alternative Healthcare Practitioners such as a Holistic Chiropractor, Acupuncturist, Homeopath or Naturopath have had great success in treating the underlying causes of heart disease. Holistic Chiropractors look to understand the cause of your heart disease by determining what in your lifestyle and eating habits are contributing to your heart disease. Treatments are focused on enhancing the diet and balancing your digestion, thus eliminating the source of the heart disease. By developing a well-rounded, multifaceted approach will help you understand how to maintain a normal blood pressure level and what you can do to increase your cardiovascular and blood pressure health. You can reduce your risk of diabetes by eating a healthy diet, maintaining a healthy weight, and being physically active. Working with a Holistic Chiropractor who can help you monitor your blood pressure and address the underlying cause of your high blood pressure is important. By developing a well-rounded, multifaceted approach will help you understand how to maintain a normal blood pressure level and what you can do to increase your cardiovascular and blood pressure health.